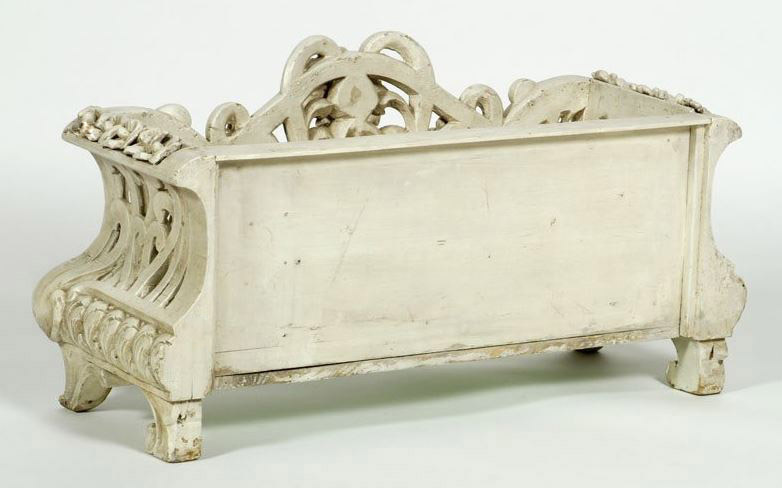 A Fine French 19th/20th Century Art-Nouveau (1885-1917) White-Painted Carved Wood Planter, in the manner of Hector Guimard (French, 1867-1942). 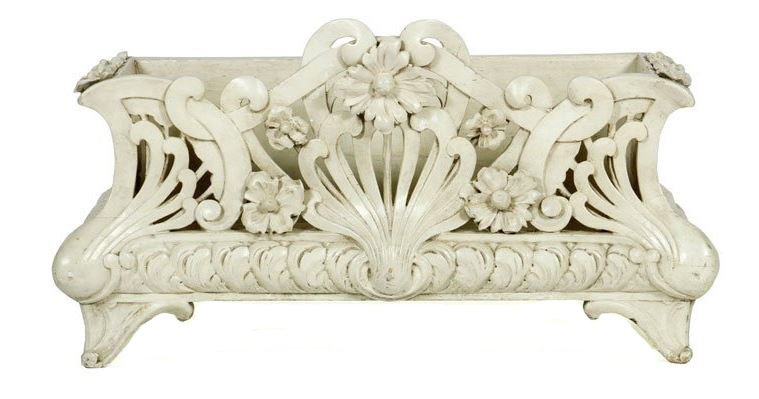 The rectangular body with rounded edges and carvings of flowers and scrolls, raised on cabriolet feet. Fitted with a metal pull-out planter tray. Circa: Paris, 1900. Hector Guimard (1867-1942) was a French architect, who is now the best-known representative of the Art Nouveau style of the late nineteenth and early twentieth centuries. In 1893 he designed the lettering and street numbers for the Hotel Villa de la Réunion at 142 avenue de Versailles, Paris, which were produced for him by the ceramicist Emile Muller. The following year Guimard visited the Hôtel Tassel in Brussels, designed by Victor Horta, and the latters works was to become a profound inspiration. The Castel Béranger made Guimard famous and he soon had many commissions. He continued to develop his own form of Art Nouveau, especially devoted to the ideal of harmony and continuity, which caused him to design the interior furnishings and decoration of his buildings as well. This approach culminated between 1909 and 1912 when he created his own home, Hotel Guimard his wedding present to his rich American wife) where ovoid rooms contained unique pieces of furniture which are considered integral parts of the building. Guimard also employed some structural innovations, as in the extraordinary concert hall Humbert-de-Romans (1901), where a complex frame divided sound waves resulted in perfect acoustics (built 1898 and sadly demolished in 1905), or as in the Hôtel Guimard (1909), where the ground was too narrow to have the exterior walls bear any weight, and thus the arrangement of interior spaces differ from one floor to another. The curious, inventive Guimard was also a precursor of industrial standardization, insofar as he wished to diffuse the new art on a large scale. His greatest success here – in spite of some scandals – was his famous entrances to the Paris Metro, based on the ornamented structures of Viollet-le-Duc. The idea is taken up – but with less success – in 1907 with a catalogue of cast iron elements applicable to buildings : Artistic Cast Iron, Guimard Style.